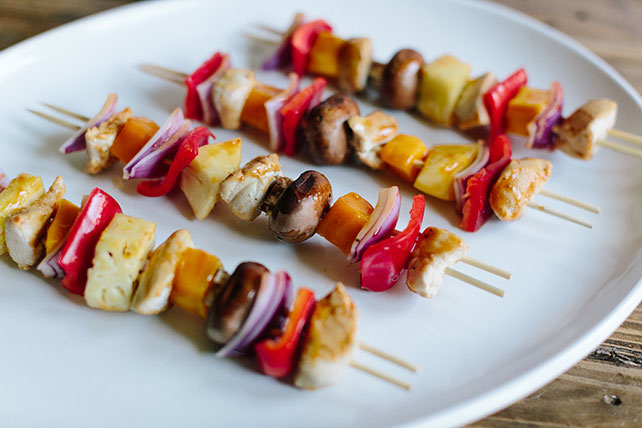 Give your next batch of chicken kabobs tropical appeal with the zesty chipotle BBQ sauce and chunks of pineapple and mango. Thread chicken, fruit and vegetables alternately onto 8 skewers to make 4 kabobs, using 2 skewers placed side-by-side for each kabob. Mix remaining ingredients until blended. Reserve half the barbecue sauce mixture; brush remaining barbecue sauce mixture onto kabobs. Grill 8 to 10 min. or until chicken is done, turning and brushing occasionally with reserved barbecue sauce mixture. Prepare recipe as directed, substituting skinless salmon fillets, cut into 1-inch chunks, for the chicken. Or, substitute uncooked peeled and deveined extra-large shrimp for the chicken, reducing the grilling time to 4 to 6 min. or until shrimp are done. Cut each mango in half, just clearing the long flat seed. Score the flesh into squares of desired size, being careful to cut up to, but not through, the skin. Press the skin so the cut fruit pops outward, then cut the cubes from the skin to remove. Prepare using 1 drained can (14 fl oz/398 mL) pineapple chunks in juice.